Many of you have asked for it and now the day has finally arrived! I am super excited to be launching Wholesome Cook’s first eBook: My Whole Food Philosophy! And to celebrate I am hosting the biggest Wholesome Cook giveaway yet! You could win an iPad3… This giveaway is now closed but you can still get my book for only $15 in PDF, or even less if you subscribe to the newsletter. 27 recipes for transforming classic junk food dishes into nutritious meals. Think spring rolls, fish and chips, muffins and yes, sugary drinks too! 1) You MUST download a copy of MY WHOLE FOOD PHILOSOPHY (free or paid). 2) You MUST register your download via the table below. 3) Bonus entries available below. 4) Entries close midnight 30 August 2012 EST (2:30pm 31 August Sydney time). 5) Winner will be announced in a post on Monday, 3 September. 6) The prize consists of one iPad3 16GB wifi and postage. 7) Competition is open WORLDWIDE. Enjoy the book, leave feedback via email and good luck! Martyna, congratulations! What a huge job you’ve done and this giveaway is huge! Good luck with it! Thanks Maureen, I’m super chuffed! It was going to be a small little project and turned into something much bigger that I had ever anticipated. 🙂 Good luck in the giveaway! Congratulations, Martyna, what an accomplishment! Can’t wait to check out the book and cook my way through it. You know we’re passionate about whole foods in this house, so I have no doubt your suggestions and recipes will be as beautiful as they look 🙂 Congrats again! I love the recipe for hazelnut chocolate spread- my boyfriend goes through Nutella like nothing else, and this will be a lot healthier! I have some haloumi in the fridge crying out to made into the Confetti Salad with Haloumi – sounds yummy!! Really excited about this cookbook – especially the quick pork sang choy bau! Can’t wait to make the hazelnut spread, I love anything with hazelnuts so it should be awesome. Read it, loved it, and ready to make all of it. The pumpkin soup is the first one I’ll make. thanks a million. Congrats on the lovely book! Download from today’s email worked perfectly 🙂 As for my fav recipe… hummm, I’m going to go with the Pumpkin Coconut & Chilli Soup because soup is just about all I can think about in this cold weather, but the Choc Hazelnut & Pear Slice looks fab as well! Congrats from Germany! I love your blog and I also love your book! Thanks very much for sharing! Wow I will so enter in this competition, the best giveaway Ive seen on blogs so far. What a gorgeous book! Thanks so much Martyna. Have to say every single recipe looks wonderful and achievable, but the first thing I’m going to try is the pumpkin soup. It’s a great twist on a classic and I might even be able to tempt my pumpkin-hating husband into eating it! Love Haloumi…. and the choc hazelnut spread sounds great. Just new to the site and am enjoying going over recipes in the archives. Like the cookbook, and pics are great. Congratulations on the launch of the book Martyana. What a wonderful accomplishment to put all of this together. I’m going through it now, but it looks beautiful and everything looks delicious!! The pumpkin soup is my favorite. Thanks. Congratulaions!! The book is great, I have some Kale so Cabbage, bean and crispy kale will be my first recipe on the list. congratulations on your delicious success – keep the yummy coming! Can’t wait to try the Baked Spring Rolls…and so many other things as well 🙂 Yum! Pumpkin coconut and chilli soup sounds delicious! 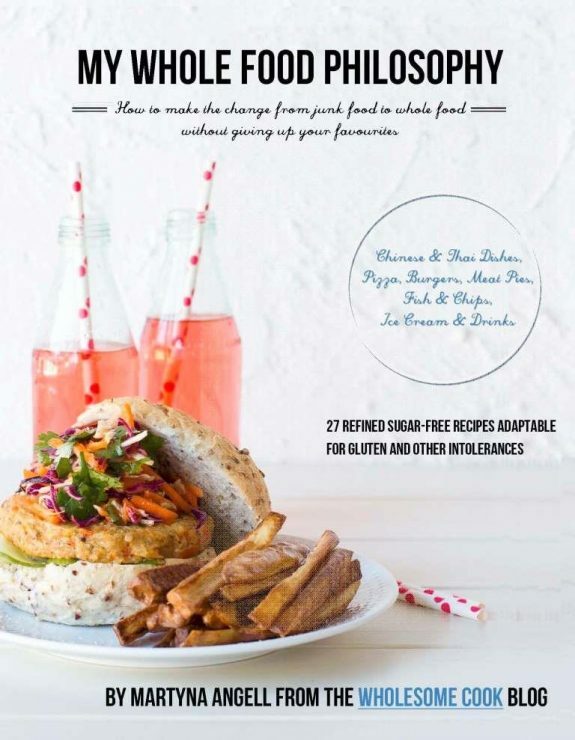 Love the idea of this cookbook! Congrats on the ebook! Going through it now! Everything looks great, but I must say the chocolate hazelnut spread has me drooling and I will be making that first! I love everything pumpkin! That pumpkin soup looks delicious! There’s a pumpkin pizza in there too – thanks for downloading Nicole! Finally, I will get healthy from whole foods. I am a kale lover, so there you go. Thank you so much for the beautiful download and the opportunity to join in your giveaway. You’ve done an excellent job on the book…you should be so proud. Love the book! Love the recipes! Love the little snippets of information and tips. Amazing job Martyna! Pat on back! It’s downloading now, can’t wait to check it out! CONGRATULATIONS!!!!!! The uppercase is not enough to describe how happy I am for you Martyna! This is awesome! Going to check it out now. I am supposed to pick my favorite – Mango and Yoghurt ice pop. I’m going to make it this weekend. Thanks for your wonderful FREE recipes!! I just went through your cookbook and I’m so impressed by your detailed and thorough work. I’d never even thought of making a cookbook. So much work!!! Great job Martyna! This is really amazing accomplishment and words can’t describe. Martyna the book is gorgeous. I downloaded it last night(twice! Inadvertently!). You take amazing food pics, they are styled beautifully, you definitely have a real talent for it. Martyna, you’re legendary… I just bought your book on Kindle, and it’s changing the way I think about food… as an essential, rather than just fuel. Favourite recipe? Definitely the chicken, mushroom and soba soup! Favourite recipe is baked spring rolls! My favourite is the Oven=baked Chicken Kievs with cucumber salad, I would use babt spinach leaves and dill fresh from my vegetable garden. Wow, these recipe’s look absolutely wonderful. Can’t wait to start cooking, I just don’t know what to make first! Sang Choy Bau is one of my absolute favourite foods, I think I’ll start there! I love this book! My kids will like the hazelnut chocolate spread. wow thank you so much for the book,definelty will come in handy ,we are a big gluten free household and a few of the recipes i’ve eyed out look delish! Many thanks for this lovely e-book and for sharing it with us! Your food philosophy is quite close to mine and your recipes look pretty delicious! Be sure I will try them very soon. Thanks again! Oven-baked Chicken Kievs with Cucumber Salad is amazing! I love the baked spring rolls! All I have to say is wow! what a fantastic book. The recipes look divine and I cant wait to try the lentil couscous salad this week. Not only is it beautiful presented with gorgeous photos, it is also written so well too, I love blogger cookbooks so much more than celebrity ones. They tell a story with the food and its so much more inviting and not mention you know they have tried and tested it to perfection. I cant wait to start trying them out. I almost couldn’t get past the picture of the Pumpkin Coconut and Chili Soup w/Garlic Croutons…yeah, my senses can’t wait to taste that! Congratulations and good job! Just found your site today for the first time, and have just purchased your book for my ipad & kindle! Excited to try out the choc banana ice cream! Thanks for the cookbook, the Pumpkin Coconut & Chilli Soup looks to be my favorite so far! MY favourite recipe would have to be Roasted Pumpkin Pizza with Yogurt Sauce, very yummy and a great mix of ingredients! the lentil pumpkin and Couscous salad makes my mouth water!! Great ideas, yep that roasted pumpkin pizza sounds right up my alley. I’ve just had a quick look & the book looks great. Can’t wait to spend more time perusing it…. Oops – forgot to mention my favourite recipe. I’m loving the sound of the Pumpkin, Coconut & Chilli soup with garlic croutons. Perfect on a cold winter night. I made your pumpkin soup recipe at our son-in-law’s , but with fresh ginger and it was a huge hit. I love your father’s feelings about eating inventions…..that was one of the rules in our house when our three were growing up. What is great is that the next generation is following along the same lines with the grandchildren! Hi Margaret, that’s fantastic to hear – you have done a great job educating your children! PS I will try the soup with ginger next time. The Chocolate Hazelnut Spread recipe will be the first one I try. We avoid artificial ingredients because of my daughter’s ADHD, so I’ve been looking for a fantastic all natural recipe. Beautiful book, congratulations! The Quick Pork San Choy Bow looks nutritious and delicious, using in season fresh ingredients means it must be economical too! OMG… im in love with the sounds of the herbed baked beans…..must go out and buy everything i need…. What a great cookbook, many thanks. It’s great to be able to find recipes that my family will love. I can’t wait to try the CHICKEN MUSHROOM AND SOBA NOODLE SOUP. Looks delicious! Can’t wait to try the Passionfruit Blueberry & Yoghurt Muffins. The mango and yoghurt ice pops are yummy! My favorite recipe was called “Choc Hazelnut and Pear Slice” – the pears really complemented the flavor of the chocolate. So Yummy! Thanks Liz! 🙂 On all counts! How is the French Oven Set going? Oh I am loving them!! My favourite so far has been the garlic and red wine lamb shanks I did – which actually fitted properly in the big one (this is exciting because it’s the first time I’ve had a pot the right size!) Thank you again (and Kitchenware Direct)! Thanks so much for you e-cookbook! I am an allergy sufferer, and I’ve been working to really refine my diet and eat more wholesome meals! I am stoked to have this in my toolkit! Looking forward to trying these… Especially the QUICK PORK SANG CHOY BAU! Congratulations Martyna on your amazing achievement! This is a BRILLIANT book! I’ve published e-books and I know the HOURS of effort it takes to create something so appealing. I think it would look beautiful in hard cover. Your photos are SO ENTICING…my hubbie asked what I was reading as I kept groaning ‘Yuuuuuum! Yuuuuuummmmmm!’ That carrot soup looks so divine. Can’t wait to make it-and I don’t even like carrot soup! Confetti Salad with Haloumi – recently discovered Haloumi – yum! My favourite recipe would have to be the baked spring rolls. My 6 year old daughter loves spring rolls, but I can just smell all the bad additives when I bake the frozen spring rolls for her. I will feel much more confident feeding your version to her! I have only just found your site today but wow I am so please I stumbled across it. Thank you for holding such an awesome give away too, that is such a bonus. Will definitely share this fantastic site. ICE CREAM. So good and really quick to make. I can’t wait for my son to try the healthy fish fingers!! It’s a wonderful book tackling the big issue of substituting taste for healthy. I love Spicy Buckwheat and Soya Burgers with Asian Mayo-Free Slaw. Yum yum yum! Everything looks delish! I have to make the hazelnut spread!! CHOCOLATE AND PEANUT BUTTER COOKIE SANDWICHES, I think has to be my favorite right now. They look so yummy! What an amazing achievement – congratulations!! You have a beautiful blog – I’m so glad to have found you. My favorite recipe is them cottage cheese caprese. thanks for this great giveaway and the e-cookbook. The meat pies with mushy peas and gravy looks like something we all need on these cold nights. This is an amazing cookbook! 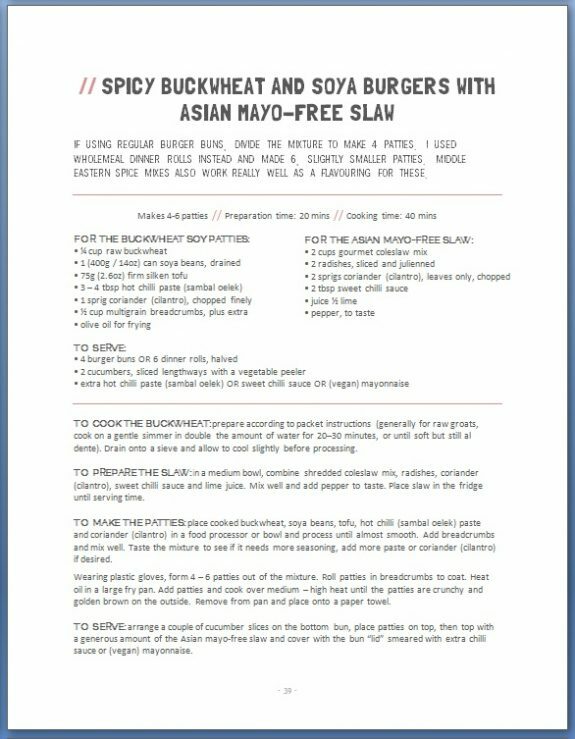 I would have to say that my favorite recipe from it would have to be the Spicy Buckwheat and Soya Burgers with Asian Mayo-Free Slaw. Not only is it simple and not very time-consuming to create, it’s also vegan/GF (if desired.) Which is simply amazing. Most of all it tastes great! Pumpkin Coconut & Chilli Soup -sounds like a perfect combination! This is fabulous! The Carrot, ginger & quinoa soup looks beyond vibrant and the most tender beef stir fry is a winning dish. Thanks for your posts, recipes, and congratulations! the hazelnut spread, having 4 kids in this house…and me…we go through nutella like it’s going out of fashion! great recipes, love them all, thankyou! Don’t hesitate – give me the cheesecake! Healthy fish fingers and oven baked chips are one of my favourites. Thank you so much for sharing and thank you for the great prize on offer. Fantastic cookbook. great cookbook. thanks so much for the download. The Pumpkin Soup looks and sounds delicious. I can’ wait to try it. I love the sound of the cabbage bean and kale soup… simply because kale is one of my fave veggies! Love chicken mushroom and soba noodle soup. Looks so delicious. Thanks Martyna for a fabulous e-cookbook that caters for my many and varied dietary requirements! the book looks fantastic, love the font, the layout and your beautiful photography. Well done! Meatballs in a creamy horseradish and dill saucewith buckwheat. OH. EM. GEE!!! I can’t wait to meet you in person when I move to Sydney! Carrot ginger and quinoa soup… Amazing! Perfect for these cold nights, thanks! Absolutely love the book! A little something I needed to become a healthier and happier me! Thanks Martyna! Love the book! Really like the Baked Spring Rolls with Vegan filling, so much more healthier for me. My favourite recipe is the Lentil pumpkin and couscous salad – a very simple yet versatile recipe that can be served warm or cold thus great to have throughout the entire year! Fabulous book – can’t wait to try out the recipes!! What a truly great cookbook! Thanks for the wonderful Pumpkin, coconut and chilli soup recipe – It was delicious! If I only ever owned one book this ebook would be it, what a great use of technology and would be perfect and ideal for the kitchen. I can’t wait to cook every recipe in your book. congrats and well done. Love the roasted pumpkin pizza with yoghurt sauce! in some giveaways i click enter without tweeting or sharing and the counter count it !! i want to know if it counted or not ?? I will be double checking all entries for authenticity 🙂 So if you didn’t share or tweet, it won’t be counted. Hope that helps. Quick Pork Sang Choy Bau is absolutely yummy. Made it for dinner and everyone loved it.Will definitely be making it again. Definitely the Quick Pork San Choy Bow – my kids love eating with their fingers. What an awesome ebook, can’t believe it was free – thank you! 🙂 And thanks for the great giveaway! Pumpkin Coconut & Chilli Soup OMG how exotic and yummy does that sound, a must try!! Love your book- delicious as well as healthy! Looking forward to trying the Carrot, Ginger and Quinoa soup, with my food intolerances this dish looks appetising, nutritious and healthy. I can’t wait to try so many things – the buckwheat and soya burgers and the carrot, ginger and quinoa soup are on the menu tomorrow. Yummo and thank you! Proof that eating HEALTHY can be an absolutely DELICIOUS EXPERIENCE!